"It turns out that there is a long and respectable tradition of selling receivables; it's called receivables factoring." "Factoring is a great way to reduce risk for small to medium sized businesses." "Borrowing against receivables isn’t new. For hundreds of years, cash-strapped companies have hired companies known as factors to advance them funds." You Get your Cash Flow Right, We Guarantee it. With our lending programs any business, regardless of size, can get funding easily and fast. If you have money owed to you by credit worthy clients, then you can get funding in just 3-5 business days. We offer a range of services including; Purchase order finance, factoring services, inventory finance, asset based lending and other alternative financing options. 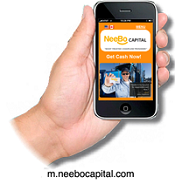 Ron Hallister explains Neebo Capital’s lending options. Factoring is a procedure which you assign your accounts receivable to our company, we handle your leg work and get your accounts for you. We advance a percentage of the face value of the invoice. Typically, advance rates range from 70% to 90%. Factor Only Clients You Want! Factor only invoices you need! » 08/01/2012 Debt Financing or Off Balance Sheet Financing?